When it comes to gift giving, presentation makes a big difference. But not everyone is a master wrapper. With Wrapped LA, you don’t need a lot of time, patience, or fine motor skills to make your gift stand out. Available in nesting sets of three, these reusable gift boxes come in your choice of beautiful designs that look richly textured but feel smooth to the touch. Just like there’s an art to wrapping, there’s an art to every Wrapped LA design. The images for the paint-splattered, animal print, and faux wood boxes are created from photographs captured by the team at Wrapped LA giving each box a vivid photo real quality that makes you want to reach out and touch it. CEO Ryland Arnoldi came up with the idea for Wrapped LA after watching his father wrap gifts using paint-splattered butcher paper from his art studio. 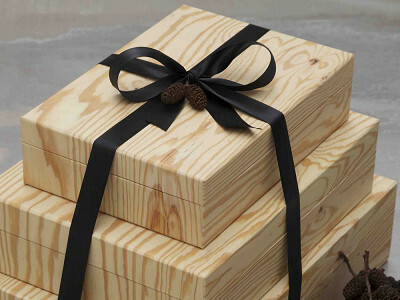 Tie a ribbon around these designer boxes for a friend and a set of three becomes a gift in and of itself. Or use one box to package a present and keep the others to decorate your shelves, store keepsakes or conceal loose items in style. A designer journal from Wrapped LA is also sure to please. It’s the thought that counts, but a gift from Wrapped LA certainly make a lasting impression. When it comes to gift giving, presentation makes a big difference. But not everyone is a master wrapper. With Wrapped LA, you don’t need a lot of time, patience, or fine motor skills to make your gift stand out. Available in nesting sets of three, these reusable gift boxes come in your choice of beautiful designs that look richly textured but feel smooth to the touch. Just like there’s an art to wrapping, there’s an art to every Wrapped LA design. The images for the paint-splattered, animal print, and faux wood boxes are created from photographs captured by the team at Wrapped LA giving each box a vivid photo real quality that makes you want to reach out and touch it. CEO Ryland Arnoldi came up with the idea for Wrapped LA after watching his father wrap gifts using paint-splattered butcher paper from his art studio. 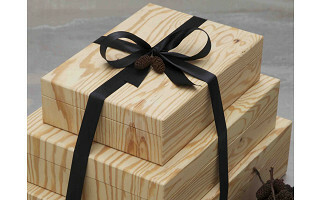 Tie a ribbon around these designer boxes for a friend and a set of three becomes a gift in and of itself. Or use one box to package a present and keep the others to decorate your shelves, store keepsakes or conceal loose items in style. 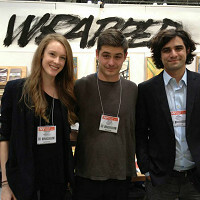 A designer journal from Wrapped LA is also sure to please.